The #1 reason that small and mid-sized businesses (SMBs) fail to implement an effective lead management approach is that they’re unwilling to invest in building the capability to produce the sales they say they want. I realize that may sound a bit harsh, yet it’s true. As an executive, you need to ask yourself: “Do I have an income mindset or an investment mindset?” Your answer to this question will contribute, more than anything else, to the long-term growth prospects of your company or career. Don’t get me wrong, keeping your eye on both is important, and the best approach is a balanced one. However, if I’ve uncovered the single biggest contributor to a company’s inability to build predictable and sustainable revenue growth, it’s the focus of an income mindset. An income mindset exists when the focus is on making sales right now. An executive with an income mindset worries about long-term growth, and tries to execute on a strategy they believe will allow them to grow the business, but their time frame for judging the effectiveness of the decision is typically only 3 – 6 months (or less). When you look at how money is spent and resources are allocated, you see a disproportionate share, focused on activities they believe will yield immediate revenue. An investment mindset looks to the longer-term. An executive with such a mindset is focused on identifying and eliminating the problems of tomorrow. They care about income, but they judge their decisions on a 12 – 24 (and in some cases longer) month time frame. To use a term from The 7 Habits of Highly Effective People, an investment mindset understands that the key to maximizing production (profit and equity value) is to build production capability. The problem with the income mindset is that, while it can lead to strong short-term results, it doesn’t build strength in the organization. In today’s Zero Moment of Truth (ZMOT) world, the company with an income mindset becomes increasingly reactive and commoditized. Their go-to-market capabilities weaken, and they become even more dependent on short-term results. Research supports the fact that an investment mindset is the key to lowering your costs for growth. The failure to invest in such capabilities may appear to be saving you money, but it's actually dooming you to a future of cost expansion. Managing the paradigm of income vs. investment is the toughest part of running a small to medium-sized business (SMB). Rarely does an SMB have all the resources it wants to invest; yet, if they focus too much on the “now,” they will weaken their opportunity to scale growth. It’s critical to find a balance. You can react to opportunities as they arise, and deal with intense commoditization, margin pressure, complexity and disruption. You can build a business development capability that allows you to generate demand, win in the ZMOT and deliver a compelling value proposition from a proactive posture. Neither path is easy, but one provides the promise of predictability, sustainability and growth. If you choose the latter (and for your sanity, peace of mind and wealth, I certainly hope you do), you must accept that building a business is a process. Customers go through a (relatively) predictable journey. 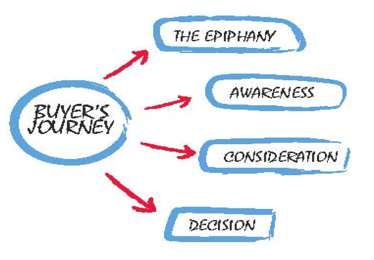 Your job (should you choose to accept it) is to align your business development approach with their journey. The more you attempt to short-circuit that journey, the less effective your growth efforts will be. For example: Marketo, a marketing automation provider, has shared that on average, it takes 123 days for a marketing qualified lead (MQL) to become an opportunity, and it can take 6 – 12 months (or longer) for a lead to become an MQL. “Too long,” you say. Fine. Ignore the opportunity. Don’t build the mechanism to attract, nurture and convert that lead. It’s not a big deal, and it won’t cause you a headache, because 90% of those leads will never have a conversation with you and you’ll never know what you missed. Go ahead and wait for the prospect to reach the end of their consideration phase, when they start narrowing down vendors. If you’re one of them (which is unlikely, because you weren’t there when they started their inquiry), don’t complain that they have unreasonable expectations and the only thing they want to talk about is price. Companies that scale growth know that the sales they make today were caused by something that happened 12 – 36 months ago. They know that the actions they take today will directly impact the strength of their business 12 – 36 months from now. And they realize that if they want to get off the treadmill, grow the business predictably and enjoy the fruits of those efforts, they must invest in that capability now.